NEW! Author John Galluzzo co-wrote this new photo-book about the aviation history of Massachusetts for Arcadia Press' popular "Images of America" series. Although the book provides a general survey of aviation in Massachusetts, NAS Squantum and NAS South Weymouth are prominently featured. 128 pages. Filled with hundreds of photographs. You can obtain this book on-line here. NEW! Second World War military service memoirs of Navy blimp pilot Donald Venton, who served with ZP-11 at NAS South Weymouth during 1944 and 1945. 207 page softcover. Chapters cover Don's flight training and wartime assignments to Texas, Brazil, and South Weymouth. Among other things, the author was on board the K type blimp K-34 when it crashed into the Atlantic Ocean off the coast of Massachusetts with the loss of two crewmen. Of interest to anybody who is interested in a first-person description of what went on at NAS South Weymouth during the Second World War. Remember, back in the old days there were two types of patrol squadrons - ZP for blimps and VP for conventional aircraft. Not available in stores. To order on line go here or send a check for $25 to Naval Airship Association, PO Box 700, Edgewater FL 32132. NEW! Here it is - after nearly ten years of research and writing - the first comprehensive illustrated history of NAS South Weymouth. 739 pages of informative text and 828 illustrations covering NAS South Weymouth from before the first ground-breaking in 1941 to the base closure in 1997 and up to the present redevelopment into the SouthField community. Everything you ever wanted to know about NAS South Weymouth in one gigantic volume that's literally the size of a telephone book! This book is not available in stores and can only be obtained on-line directly from the publisher by clicking here for softcover ($45 plus shipping) or by clicking here for hardcover ($55 plus shipping). This book, "NADU: The Forgotten Naval Air Development Unit of NAS South Weymouth", presents the story of the Naval Air Development Unit (NADU) that operated at Naval Air Station South Weymouth between 1953 and 1961. NADU was a little-known regular Navy command that provided flight testing support for secret military R&D projects associated with the MIT Lincoln Laboratory, Office of Naval Research, Naval Research Laboratory, Air Force Cambridge Research Center, MITRE Corporation, and similar organizations. Perhaps the most important project that NADU was involved with was the pioneering computerized Semi-Automatic Ground Environment or "SAGE" air defense system. Though largely forgotten today, NADU had one of the most diverse fleets of aircraft in the Navy. NADU operated jet fighters, radar picket aircraft, ASW aircraft, transports, and blimps. This 571 page book is a comprehensive illustrated history of NADU, telling its complete story for the first time ever using detailed narrative, 405 illustrations, and personal remembrances from NADU veterans. This book is not available in stores and can only be obtained on-line by clicking here for softcover ($36 plus shipping) or by clicking here for hardcover ($50 plus shipping). This book, "NAS Squantum: The First Naval Air Reserve Base", presents for the first time ever the complete story of the historic but nearly forgotten naval air station that once stood on the site of the present-day Marina Bay condominium community in Quincy, MA. NAS Squantum, which was in existence in one form or another between 1917 and 1953, was the second naval air station established after Pensacola and the first in the naval air reserve program. This thoroughly-researched and comprehensive book is packed with 399 pages of informative text and 492 illustrations. 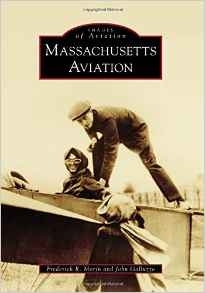 Not only does the book cover NAS Squantum, it also covers many related topics including the 1910 and 1911 Harvard-Boston Aero Meets, the 1912 Boston Air Meet, the Sturtevant flying school and test site, the Massachusetts School for Naval Air Service, the Victory Plant shipyard, the Dennison Airport, and much more. Like the authors previous book about VP-92 (see below) the Squantum book is not available in stores and can only be obtained on-line by clicking here for softcover ($30 plus shipping) or by clicking here for hardcover ($46 plus shipping). This is a reprint of "Squantum Weekend Warriors", a book that was produced by NAS Squantum, Massachusetts during 1952 in conjunction with the base's annual open house and air show. This profusely illustrated 71-page book presents the history of NAS Squantum, the very first Naval Air Reserve Training Base, with text and hundreds of photos. It is an exact duplicate of an extremely rare half century old original - complete with the originals minor printing flaws - and is a terrific piece of history. All proceeds from the sale of this book go to the VP Association. This book is not available in stores and can only be obtained over the Internet directly from the printer for $20 plus shipping by clicking here. This is a reprint of "The Defender's History", a book produced by NAS South Weymouth, Massachusetts in 1996 to commemorate the closing of the base. This profusely illustrated 90-page book presents the history of NAS South Weymouth and its predecessor, NAS Squantum, with text and hundreds of photos. All proceeds from the sale of this book go to the VP Association. This book is not available in stores and can only be obtained over the Internet directly from the printer for $20 plus shipping by clicking here. Part of Arcadia Press' popular "Images of America" photo-book series, "Squantum and South Weymouth Naval Air Stations" brings back to life the early age of naval aviation on the South Shore, from biplanes to blimps to bombers and beyond. 128 pages. Filled with hundreds of photographs of NAS Squantum and NAS South Weymouth as well as of the related Victory Plant and Dennison Airport. You can obtain this book on-line here. This is the story of VP Association member Bill Horsch's 20-year career in Naval Aviation. Starting as a Seaman Recruit in WW2, Bill climbed the Navy's enlisted ranks to retire as a Senior Chief Aviation Electronics Technician at the height of the Cold War. Originally an aircraft radio and radar systems maintainer, Bill later became an aircrewman flying many different aircraft such as the SB2C Helldiver, PBY Catalina, P4Y Privateer, R4D Skytrain, and S2F Tracker. During the early postwar era Bill was part of the elite cadre of active-duty "stationkeepers" who moved New Englands Naval Air Reserve headquarters from historic NAS Squantum, MA to NAS South Weymouth. This book features 151 pages and 33 photos covering Bill's experiences in WW2 as well as his postwar career in the Naval Air Reserve Training Command at NAS Squantum and NAS South Weymouth, MA, NAS Los Alamitos, CA, and NAS Minneapolis, MN. This book is not available in stores and can only be obtained over the Internet directly from the printer for $15 plus shipping by clicking here. Written by a squadron member, this is the story of VP-92, a Navy Reserve patrol squadron that flew Lockheed P-2 Neptunes and P-3 Orions on maritime patrol, anti-submarine warfare, and counter-narcotics missions as well as for search-and-rescue and other purposes. VP-92 was originally based at NAS South Weymouth, MA between 1970 and 1996. In 1996, due to the impending closure of NAS South Weymouth, the squadron was relocated to NAS Brunswick, ME. VP-92 operated from NAS Brunswick until it was disestablished in November 2007. The book also presents the history of NAS South Weymouth and NAS Brunswick, discusses VP-92's WW2 namesake VP-92/VPB-92, and its predecessor reserve patrol squadrons at NAS Squantum and South Weymouth (VP-919, VP-ML-69, VP-911, VP-912, VP-913, VP-914, VP-915, VP-916, and VP-917), and also discusses the circumstances that led to the creation of VP-92 in 1970. This expanded second edition has 303 pages and 451 illustrations. It is not available in stores and can only be obtained on-line by clicking here for softcover ($28 plus shipping) or by clicking here for hardcover ($44 plus shipping). In August 1970 two Navy Reserve patrol squadrons based at NAS South Weymouth, VP63Z2 and VP11Z4 were sent off together on two-weeks annual training to Naval Station Rota, Spain. This was the last annual training cruise by reserve patrol squadrons based at NAS South Weymouth before the reorganization of the Naval Air Reserve in late 1970 and the formation of VP-92. After the two squadrons returned to NAS South Weymouth, Air Wing Staff Z1 put together a 19-page saddle-stitched softcover "cruise book" for the reservists as a souvenir of their adventures in Spain. This is an exact reprint of that rare Navy cruisebook. It is filled with photos of squadron personnel, their Lockheed SP-2H Neptune aircraft, and shows many of the things that they did both on and off duty while in Spain. All proceeds from the sale of this book go to the VP Association. This book is not available in stores and can only be obtained over the Internet directly from the printer for $12 plus shipping by clicking here. In July 1967 three Navy Reserve patrol squadrons based at NAS South Weymouth, VP-911, VP-912, and VP-913, were sent together on two-weeks annual training to Naval Station Roosevelt Roads, Puerto Rico. This was called "The Hardware Cruise". For the purpose of this joint training exercise the three reserve squadrons were temporarily designated VP-910. After the three squadrons returned to NAS South Weymouth, Reserve Air Wing 91 put together a 19-page saddle-stitched softcover "cruise book" for the participants of this training exercise as a souvenir of their adventures in Puerto Rico. This is an exact reprint of that rare Navy cruisebook. It is filled with photos of squadron personnel, their Lockheed SP-2E Neptune aircraft, and shows many of the things that they did both on and off duty while on this exercise. All proceeds from the sale of this book go to the VP Association. This book is not available in stores and can only be obtained over the Internet directly from the printer for $12 plus shipping by clicking here. This 115 page book is a collection of "sea stories" recounting the experiences and adventures of Naval Air Reservists who flew and maintained PBY Catalinas, P4Y Privateers, P2 Neptunes, and P3 Orions with the various reserve patrol or "VP" squadrons that were based at NAS South Weymouth between 1953 and 1997. There are a few stories included about the carrier anti-submarine or "VS" squadrons that were assigned to South Weymouth as well since many of the personnel assigned to the base's VS units were transferred to the VP squadrons when the VS units were disestablished. It will be of great interest to anybody who served in the Naval Air Reserve or who is interested in Naval Aviation. All proceeds from the sale of this book go to the VP Association. This book is not available in stores and can only be obtained over the Internet directly from the printer for $15 plus shipping by clicking here. This NEW book is a second volume of "sea stories" similar in concept and format to Volume One presented above. 115 pages of oral history as recounted by veterans of the Naval Air Reserve patrol squadrons based at NAS South Weymouth and with a few stories about NAS Squantum thrown in as well. All proceeds from the sale of this book go to the VP Association. This book is not available in stores and can only be obtained over the Internet directly from the printer for $15 plus shipping by clicking here. Former Naval Air Reserve TAR CPO Wayne H. Heiser's terrific three-volume history of the early Naval Air Reserve (shown above), which presents information about NAS Squantum and all the other early USNR air bases located across the country between 1916 and 1942, can be ordered on-line via the links here for Volume 1, Volume 2, and Volume 3. Squadron Graphics has this terrific full-color print available of VP-92's last aircraft, P-3C Orion LY127 BuNo 161127. This 17" x 12" print was created especially for the squadron's decommissioning ceremony in October 2007. It features naval aviator, NFO, and naval aircrew wings, the squadron's original guillotine and Minuteman insignia, and a brief history of the squadron. The print is available separately or with a number of framing options. Check it out here. Danish aircraft artist Mads Bangso can provide a full-color fine art print of any VP-92 SP-2H Neptune or P-3A, P-3B, and P-3C Orion with your choice of side number and bureau number. Just one sample of Mads' work is shown here. He can provide prints with multiple aircraft or with just a single aircraft. Given a little time he can probably provide prints of any Navy patrol aircraft in any squadron markings. Check out Mads' VP-92 collection at US Military Art to see more of what he can do. Former VP sailor Sean Dever's Global Media International is the #1 publisher of military aircraft (and other military subjects such as ships and tanks) photo image CDs. He has CDs covering PBY Catalinas, P4Y Privateers, P-2 Neptunes, P-3 Orions, S-2 Trackers, and many more types of aircraft. Each CD contains a hundred or more high-resolution digital images that you can print out as photographs or view on your computer. Check out Sean's complete line of "Plane-A-Pedia" photo image CDs here. We have a limited number of P-3 Orion polo shirts and P-2 Neptune ball caps left over from the 2012 reunion. The shirts, which are all gray and extra large (XL) cost $35. The caps, which are blue and adjustable to fit all sizes, are $20. Price includes shipping. Contact Bill Hanigan via e-mail if you'd like a shirt or cap and if there are any left he'll get back to you and tell you where to send your check. McGrogan's Patch Designs offers embroidered base patches for NAS Squantum, NAS South Weymouth, and NAS Brunswick as shown above. You can order these patches on line at the McGrogan's on-line storefront or by phone by calling them at 208-762-4481. The ANA Patriot Squadron has refrigerator magnets available with NAS Squantum, NAS South Weymouth, and ANA Patriot Squadron insignia designs as shown above. Each magnet costs $5.00 with shipping included. To order send a check covering the cost of the desired magnet(s) to ANA Patriot Squadron, Attn: Magnet Offer, Shea Field Naval Aviation Historical Museum, 495 Shea Memorial Drive, South Weymouth MA 02190. Be sure to send a note indicating which magnet(s) you want! On-line retailer Zazzle.com offers T-Shirts (shown above) printed with VP-911, VP-912, VP-913, and VP-92 insignia. You can order these shirts from the Zazzle web site by clicking on this link here. Other items including mouse pads, coffee cups, neckties, etc., are also available with some or all of these squadron insignias. Zazzle.com also offers similar items with other squadron insignia. On-line retailer Zazzle.com offers two-sided T-Shirts printed with the famous Squantum witch insignia on one side (as shown here) and with an arrow insignia on the back. You can order a shirt from the Zazzle web site by clicking on this link here. These web pages are Copyright © VP Association. All rights reserved.